After weeks of hounding and convincing the hubs that YES, LOCKERS WILL LOOK FLIPPING AWESOME IN THE BEDROOM, I finally reached my goal. I found a set of lockers online and successfully bribed my husband to lift them into the back of my in-laws' Jeep for a fun-filled evening of dragging them into our house. Several injuries later (including a fatal blow to a work shirt), the lockers were in place. Classic case of WINNING! 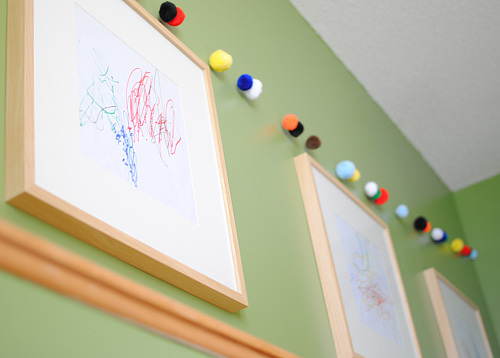 Lots of the details in the toddler's room were handmade, but none quite so memorable as the hanging stars. After finding this nifty little idea online, I scoured a few local stores looking for exactly the right tools for the job, including a stop at the hardware store where I obtained no fewer than 50 paint samples to become punchcards for my star art. I don't think the store employees will be inviting me back anytime soon. I'm a fly-by-the-seat-of-my-pants kind of decorator. In this case, I had originally hung picture frames on the wall next to the lockers before realizing DUDE! THOSE FRAMES BELONG ON THE LOCKERS! Naturally, after I'd hung the frames on the lockers, the next step was realizing DUDE! 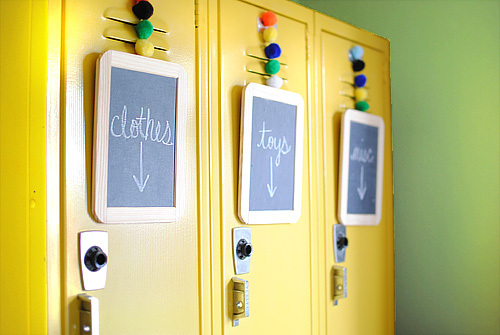 DITCH THE FRAMES, IT'S ALL ABOUT THE CHALKBOARDS! After all, what project would be complete without a few extra holes in the wall and a few unreturnable picture frames? 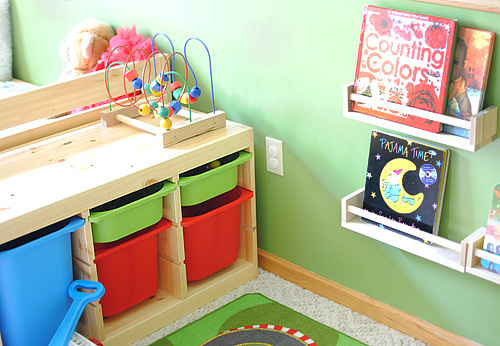 When it comes to storage, there's nothing better for a toddler than buckets. 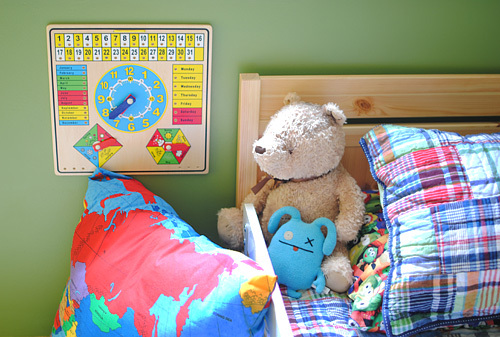 They're great for toys, fantastic for climbing, and the next time he comes down with the flu, we're already prepared! While you can't actually see it in this picture, I feel the need to point out that this room didn't come easy. I poured my blood, sweat, and tears into it... literally. There's actually a nice bloodstain on the carpet in this photo where the bed recently attacked my unsuspecting knee as I tried to put the stubborn toddler down for his nap. Around here, we're classy like that, bloodstained carpet and all. I spent hours and hours pouring over Etsy, Big Cartel, and all sorts of creepy "art" websites looking for just the right prints for the toddler's bedroom. In my quest, I saw a lot of art that reminded me of a cross between a Van Gough nightmare and Man-Bear-Pig, but because getting up at midnight when my toddler has nightmares is somewhat detrimental to my passionate love affair with sleep, we went with the less-frightening option, Crayola. If you look to the bottom of this photo, you will see a world pillow. People, I SEWED THAT PILLOW. Coming from someone who can't sew a straight line if her life depended on it, that's actually saying something. Granted, I may have been using my mother-in-law's sewing machine and she may or may not have been there talking me through the process step-by-step because she has the patience of a saint and should be inducted into some type of hall of fame immediately, but the point is, I SEWED. And the toddler is going to be grateful. Someday. 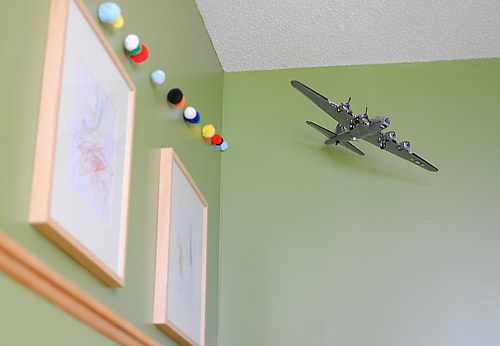 Some people might think that a vintage bomber isn't exactly toddler bedroom material. I beg to differ, especially when that bomber was constructed by the toddler's daddy when he was a little boy. And somehow it survived those years of abuse and managed to find its way onto the ceiling, albeit with a few less propellers than the original design. Last but not least, we have THE SHELVES. I am calling them THE SHELVES because those things were pure, unadulterated hell to install. Sure, the directions looked deceptively easy, but remember what I said about blood, sweat, and tears? This is where the sweat and tears came into play because whichever Swede designed those shelves for Ikea was severely sadistic. Lots and lots of wall repair, people. And lots and lots of conversations between the hubs and I about the PROPER way to use power tools. 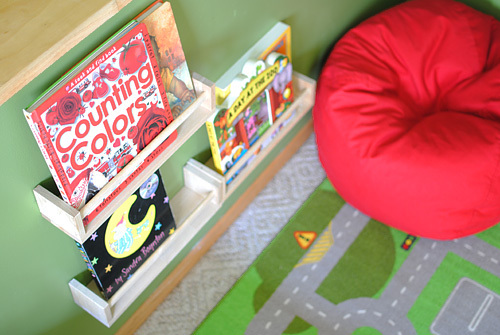 One project is officially done and now I can turn my attention to the baby's nursery which is currently filled to the brim with books, toys, and trees. Yes, trees. 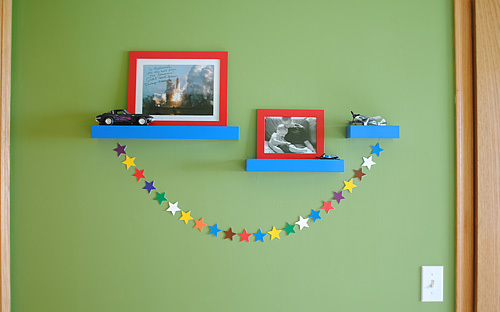 So as we embark on trying to decorate a nursery on a budget, be sure to stay tuned for more shelving disasters to come! You did such a great job! This room turned out SO FANTASTIC! 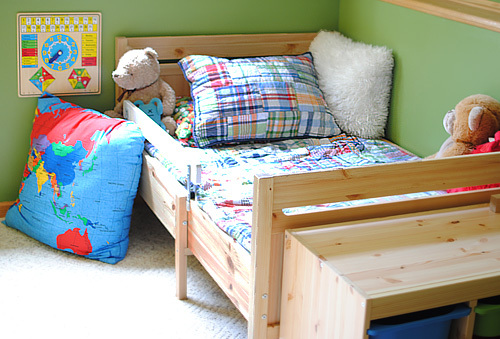 I am gearing up to start our first nursery project and this gives me the hope to try (because I am NERVOUS!). Super job, Alyssa! This looks awesome! 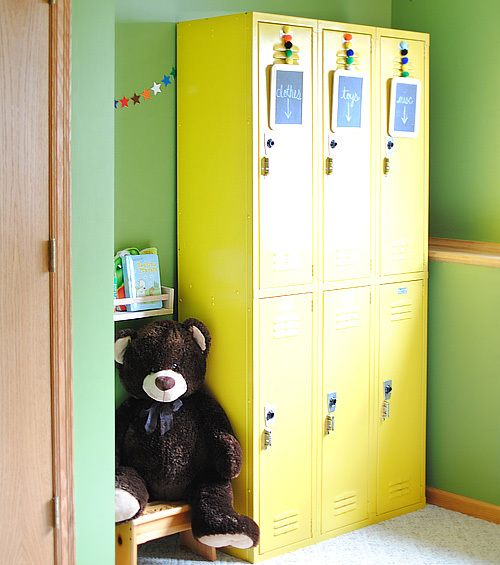 I love the lockers and shelves - when Thad is old enough I might just have to come back here for inspiration! 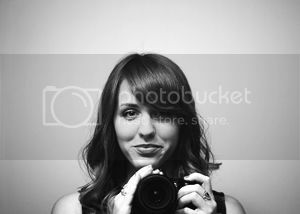 =) Thanks! What a great room! You did a fantastic job with every detail covered. I love the shelves, even if they did cause problems. I love every single thing about it! Those lockers are AWESOME! LOVE it and totally worth the wait for us ;-) I have just spent the last 10 minutes trying to tell my husband how cool lockers would look in our daughter's room to no avail. I always wanted to say I have been praying for you and all the turmoil of the last week. We had a positive FFN test at 24 weeks pregnant, with a round of steroids and several scary trips to the ER with lots of prayer. The next week, my cervix had miraculously closed up and with a little bedrest, our girl stayed in there until I was induced at 40 weeks and 2 days. Just a reminder that there is always a place for hope, regardless of tests and statistics. Praying for a happy, healthy and safe next 8 weeks! This room is adorable! I am loving the unfinished wood, and all the little details are great! The lockers look AWESOME! Thanks guys! I'm really pleased with how it turned out- and I'm glad we ended up finding a set of lockers for the room! It's loads of fun! What a great room- not too small boyish so it will be a long time before you need to decorate again. And I love the bomber plane touch, very cute. Looks great! Can I ask what color paint you used?? Hi Michelle! I would love to be able to help you with that, but when we moved into our new house we actually left the can behind for the buyer in case he wanted to keep that color in the room. I know it was a Behr paint but we went through so many sample cans trying to find the right shade that I can't remember which one we landed on. So sorry!